Lockout/tagout (LOTO) safety procedures require that tagout devices meet Occupational Safety and Health Administration (OSHA) 1910.147(c)(5) standards for quality assurance. 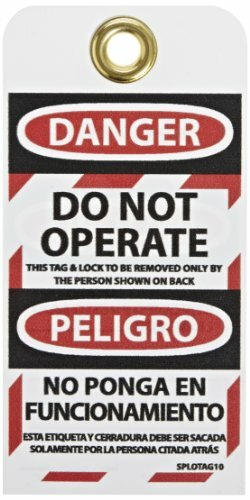 Lockout tags (also called safety tags) use color and warning text to help prevent machine operation or power activation during maintenance and repair. They are commonly used to identify the schedule and authority responsible for a lockout procedure. Sometimes a tag's thickness will be measured in mils. One mil equals one thousandth of an inch. National Marker Company manufactures signs and safety information products. The company, founded in 1934, is headquartered in North Smithfield, RI. If you have any questions about this product by NMC, contact us by completing and submitting the form below. If you are looking for a specif part number, please include it with your message.